For assistance with National-specific benefits: Lauren Foster, Director of Member Services, lfoster@thesnowpros.org or (720) 963-4834. For assistance with Eastern-specific benefits: Don Haringa, Director of Education & Programs, dharinga@psia-e.org or (518) 452-6095. How to JOIN as a Member Instructor! Use this simple search tool to confirm the membership status and certification level of your instructors. Access to the tool is limited to school directors or a designated area employee with human resources responsibilities. If you can’t access the tool via the login, or if you wish to add another area employee, please contact the office at 518-452-6095. Click here to learn about the Einar Aas Award for Excellence in Snowsports School Management. Member Customized Event (MCE) – Two full days of snowsports education. Any educational event on the schedule except Level II or Level III Exams. No minimum number of participants, maximum of 10 per group for the flat group fee of only $1,990. In-House Request – Two full days of snowsports education. Any educational event on the schedule except Level II or Level III Exams. Price of scheduled event +$25 per participant. Consulting Request – Specialized training available for each discipline. You decide the topic. Make Winter More Fun! 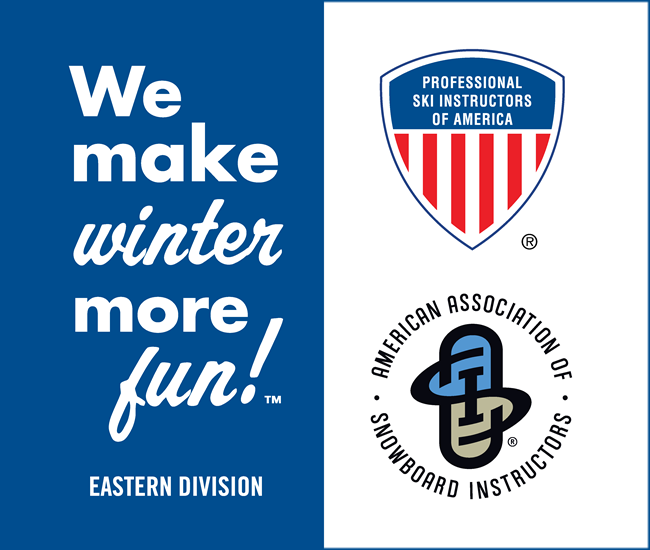 – Current Eastern Division promotional slogan targeting skiing and riding public to take lessons from PSIA-AASI members at our consumer-oriented website. Go With a Pro – a universal consumer message to increase interest in taking a lesson in order to increase the value of lessons and instructors. Winter Feels Good – Build your business with this SIA developed public awareness campaign. Learn to Ski and Snowboard Month – in January encourages children and adults to learn by taking lessons from professional instructors. It also challenges current skiers and snowboarders to improve their skills through lessons. Copy and past this code to display the “We make winter more fun!” graphic and post it on your Snowsports school web page to help promote your partnership with PSIA-AASI Eastern!